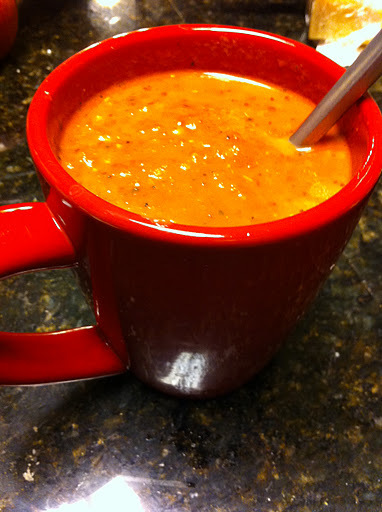 I got hooked on La Madeline’s soup when I moved to Louisiana but I think my recipe is just as good and way less expensive! I can’t believe they try to sell it in the store for $8 a jar! NO thank you! You can throw this recipe together in 5 minutes and cook it for 10 and you have dinner! By using the immersion blender first, you increase the surface area and help the flavors develop quicker and the tomatoes cook faster. If you have more time, by all means, cook it longer. Don’t worry if you don’t have fresh basil, you can always substitute dried. If you do have fresh tomatoes, even better! Cook this on top of the stove, or in the crock pot during the day, it’s just that easy. Add all ingredients to large pot except heavy cream and Parmesean . Use and Immersion blender and blend until your desired consistency. Cook on medium-low, covered for at least 15 minutes or longer depending on your time constraints. Just before serving, add the heavy cream and Parmesan cheese. Stir well and taste for seasoning. Add salt if needed. Add all ingredients to slow cooker except heavy cream and parmesean cheese. Use immersion blender to blend. Cook on low for 4-6 hours or high for 2-3 hours. Stir in cream and cheese. Taste for seasoning and adjust if needed. I'm so trying this recipe! 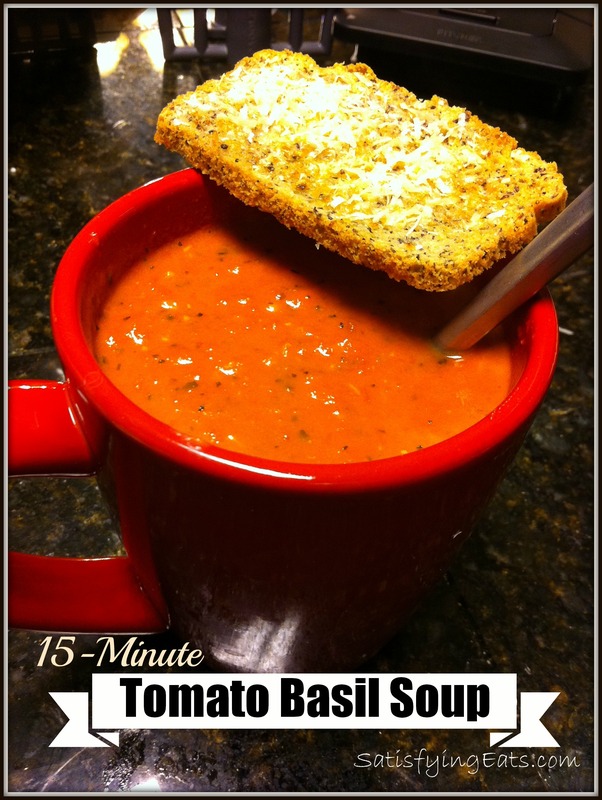 I love tomato soup but haven't found a really winning recipe. This sounds really awesome, though! Mommatiger23, please give it a try and let me know! We just had leftover soup last night with a little extra sharp cheddar sprinkled over the top. It was fantastic! This looks fantastic. 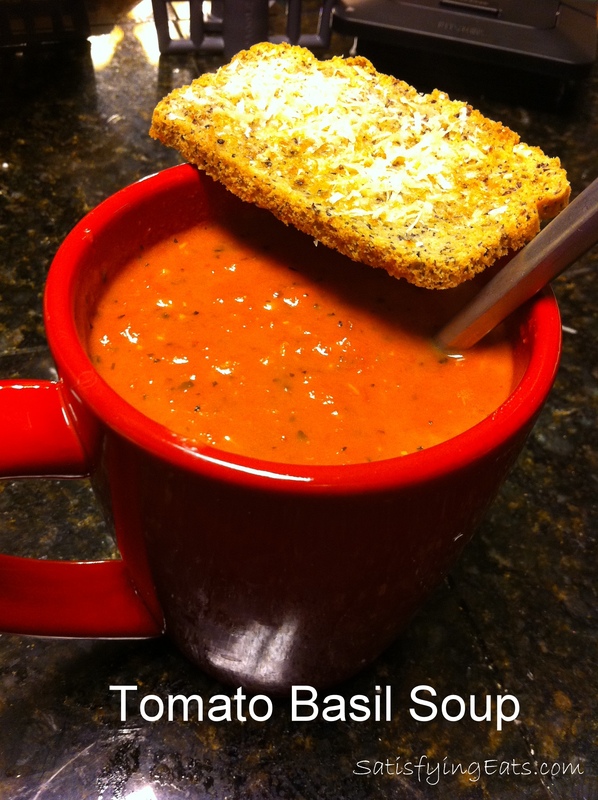 One of my favorite soups, and I've been reluctant to eat it in restaurants for years. I've always assumed it was thickened with poisons of the grainy variety. Now if my tomatoes and basil would hurry up. Thanks. Lynette, hope you enjoy it! Yes, you never know what is in the stuff at the restaurants and this one is so easy, it's worth a try! Is it two cans of tomatoes, or do you pick one? Thanks! I have a freezer full of tomatoes from my garden last year. Could these be used to replace the 2 cans of tomatoes, thawed and strained to remove seeds? I am hoping to use up an abundance of fresh tomatoes and plan on putting the soup in mason jars at the stage before the cream and parm are added. I will store the jars in the freezer until the middle of the cold windy Ontario winter here on the west coast of Lake Huron !! I will toss a jar or two into my crock pot and heat on low for the prescribed time to allow the flavours to blend — when we are ready to enjoy I will add the parm and cream and bask in the memory of all those fresh summer tomatoes !! Do you have any suggestions that will make this dream work ? **sorry that should read the West Coast of Ontario….we are actually on the east coast of Lake Huron facing west and get glorious sunsets !! If one doesn’t have an immersion blender, could i just use my Ninja blender to mix it and then cook it? Yes Deborah, a Ninja would work fine!